A new tile pattern dynamic and young in the color scheme The tile is selectable between several patterns. Square stones in different shades of gray or oblong stones in the same color scheme. The tile is ready to be laid on mats. This supports the laying and strengthens the cohesion. By simply cutting off the mat, the tile pattern is cut precisely to fit. The ceramic model stick inspires the eye and leaves a great impression in a small room. 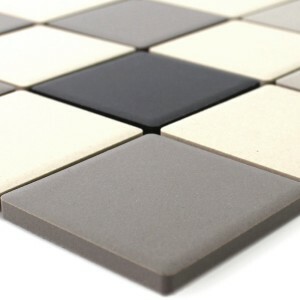 Unglazed is the new trend of a tile that applies to ceramic mosaic Miranda slip-resistant gray beige. The matt surface combined with gray tones is perfectly coordinated. 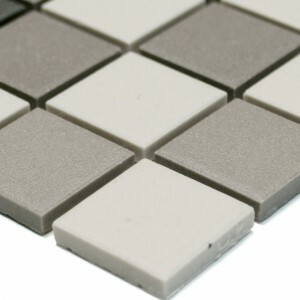 In various color patterns, the ceramic mosaic Miranda slip-resistant gray beige non-glazed R10 presents a tile mat for the bathroom or guest toilet. The laying mats make laying easy and uncomplicated. The mat can be cut to any angle. The tile is not glazed but is still water resistant. 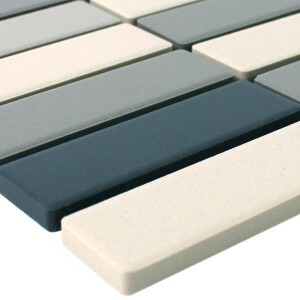 Especially in the bathroom, the non-slip tile is a protection against unwanted slipping on wet tiles. 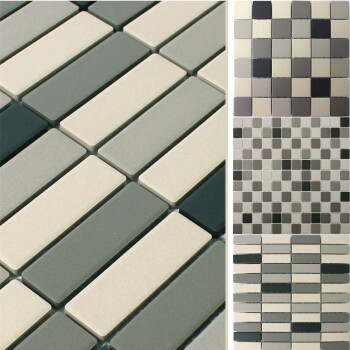 The ceramic mosaic can be combined well with white, black or beige. That is the basis for choosing your bathroom furniture. Consisting of two variants rod and rectangular tiles and two color combinations you have the choice. Another aspect is the standardized joint width, which makes jointing child's play. No spacers and annoying moving is necessary. The ceramic has only a little abrasion, so you long enjoy the ceramic mosaic Miranda slip-resistant Gray Beige Unglazed R10. Beautiful Mosakstones bundled into mats selectable in square and oblong stones. Easy to lay and adapt to any room by trimming the mats. Available in two color samples. good to combine with any interior. Slip-resistant according to standard R10.